It’s February, you’re starting to see lots of red and pink hearts on sale everywhere, tv promo slots are filled with lovey dovey messages and reminders to get that special someone a gift from the heart, and you want to gag. Says the single girl. I have never had a special someone on Valentine’s Day, which is fine with me as it means I don’t need to worry about gifts and an expensive dinner for two at a fancy restaurant. Valentine’s for the past few years for me have always meant family dinner, flowers for my mother, and cuddles with my siblings while watching Ever After and The Little Mermaid. However, I do love desserts, and we do always still get lots of Valentine’s treats from friends! 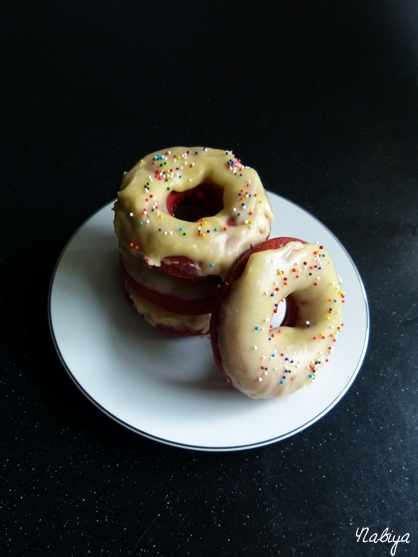 So this year, I’m baking red velvet doughnuts for everyone! I finally caved and bought a Wilton doughnut pan last week, it looked so cute, you see? I’ve been thinking of getting one ever since I saw this picture on tumblr roughly a year ago, but it’s quite difficult to get one here, and when you do find one… it’s quite expensive. But I had a bit of extra holiday money, so why not, right? We had some relatives around last Tuesday afternoon, for a tea party of sorts, and since it was my baking day anyway, I thought I’d get up a little early and work on some treats for the guests. 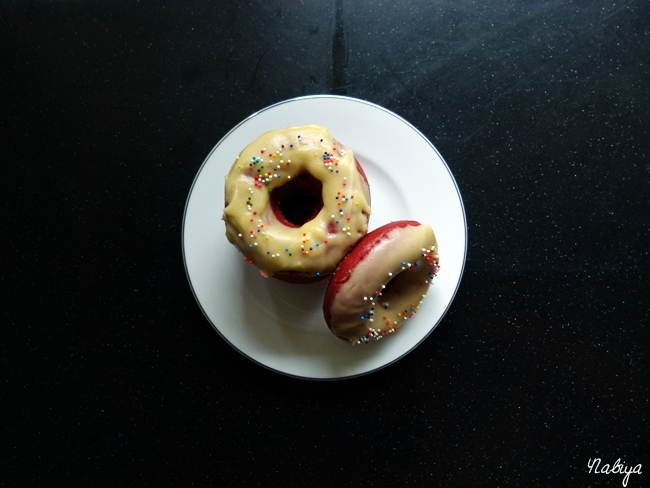 It’s a damned shame that I only have one doughnut pan, as it means waiting for several batches, and enduring the pain of standing for quite a bit of time. Bake for 10-12 minutes, take them out, let them cool in the pan for up to 5 minutes before overturning onto a wire rack. Cool completely. Transfer the frosting into a medium sized bowl, and microwave for about 15 seconds, until the mixture is runny. 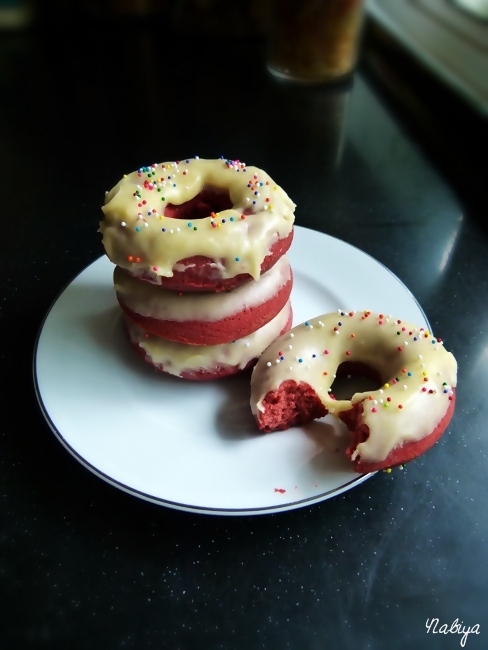 Then just whisk it lightly with a fork before overturning the doughnuts into the “glaze”. Allow this to cool to room temperature, or chill if you prefer a harder glaze. Serve with coffee or tea! I can’t recall where I got this recipe from, and I looked through all my recent browsing but can’t find it. If anybody knows, please poke me and I’ll put in the proper credit. Sorry for the fuss!